Day 1: Lake Manyara National Park. Depart Arusha for Lake Manyara for lunch at lodge, Afternoon game drive. Dinner and overnight at Lake Manyara Serena hotel/ Eunoto lodge. After breakfast, leave Lake Manyara for Serengeti via Olduvai Gorge, with Game drive and Picnic Lunch en route. The park covers 12,944km2 of open plains making it one of the largest in the world. The rocky outcrops commonly known as ‘kopjes’ in the eastern part of the park are of scenic beauty and occasionally cats can be seen lazing on them. The park contains vast herds of wildebeest, zebra, gazelle and other antelopes. Dinner and overnight at the Serengeti Sopa Lodge/similar. After breakfast take a packed lunch with you and continue with game viewing on Serengeti Park. The migration can be seen on a long chain approximately 40 Km heading to the south western direction. Around 1230 and 1300 break for your lunch. After lunch have a rest for one hr, then proceed with your game viewing following the move of the migrants on the southwest of the park. Aprox 1.3 million wildebeest, 250,000 gazelles and 200,000 Zebras have been recorded sharing the short grass/ water which is the source of food for the millions of Animals in this South Area. 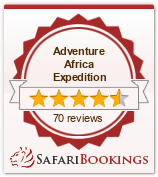 Dinner and overnight at the Serengeti Sopa Lodge or Camping similar. Day 4: Serengeti - Ngorongoro. This morning after breakfast you descend 670 meters to the Crater Floor with picnic lunch to enjoy a full day of game drives in the "eighth wonder of the world", Ngorongoro Crater, the largest unbroken caldera on earth. The crater is 14.5km. wide and is home to all the big five and hence the same may be seen. Hippos, cheetah, antelopes and the spotted hyena are other species commonly seen as well as flamingo's on the crater lakes. Return to the lodge in the evening for dinner and overnight at one of the luxury lodges or Camping that overlook the crater. After breakfast we depart to Lake Manyara driving through the Ngorongoro Conservancy and arriving at our hotel/lodge in good time for lunch. After a short siesta we go for an afternoon of Game Viewing with eyes open to try and catch a glimpse of the tree climbing lions that are a peculiarity of this game sanctuary. Numerous other wildlife species such as gazelles, impala, buffalo, wildebeest, hyena, baboon, giraffe, hippopotamus, and a great number of smaller mammals, 350 species of bird, storks and flamingo's.are also to be found at this Lake side game park. This beautiful park is at the base of the Great Rift Valley escarpment and comprises of forest, woodland, grasslands, and swamps. The park contains five distinct vegetation zones and is of scenic beauty.. Dinner and overnight at one of the luxury resorts around the Lake. After breakfast, depart Lake Manyara National Park, for the Northern Tanzania Tourist Capital of Arusha arriving in time for lunch. 3.Soft drinks, beer, sodas etc.